The planned Tesla model for plebs – the Model 3 – has been delayed to 2018 from an original planned shipping date of early 2017. 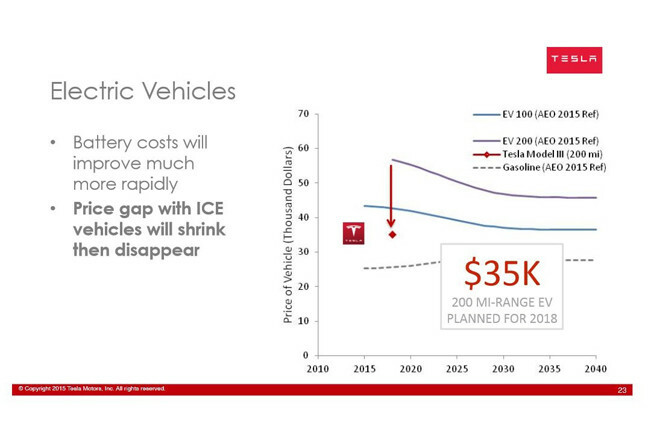 According to slides put out this week by JB Straubel, Tesla's CTO, the $35,000 entry-level electric car is "planned for 2018." When the Model 3 was first announced, it was scheduled to be shown in 2016 and launched in 2017. Then in November of last year, Tesla CEO Elon Musk revealed it would be delayed to late 2017. The latest slide deck shows production has slipped further, meaning Tesla's high-tech all-electric vehicles will remain out of reach of most consumers for another three years. Tesla has tried to scotch the "delayed again" headline by playing with semantics, claiming Straubel meant only that the production version of the car will be ready in 2018 and that it will still be released in 2017. Tesla's share price has dropped as a result of the news, but only slightly – just over one per cent. Model 3 remains on schedule. As we've stated, we plan to show Model 3 in 2016 and begin production in 2017. JB's slide is a high-level look into when Model 3 will be in full production. The Model 3 will be funded by sales from the still-unreleased Model X SUV that Tesla plans to start selling later this year. The Model 3 appears to be following the same pattern of delays as the Model X. The X was first shown in 2012 and production was originally scheduled for the end of 2013. It was delayed several times, however, as Tesla focused on its existing Model S.
In February 2012, the company said the Model X would be available by the end of 2013. In February 2013, it said that would then be late 2014. In November 2013, Tesla did the exact same thing it has done this week and said the X is on schedule but that only small numbers will be available by the end of 2014, with actual deliveries beginning in the third quarter of 2015. If history is any indication, Tesla has delayed the Model 3 because it is focused on getting the Model X out the door on time.